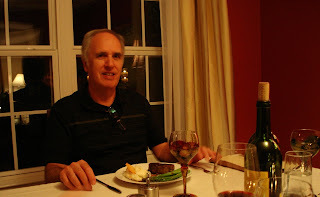 Mary Ellen's Cooking Creations: Dad's Birthday Dinner - Lots of Delicious Food! My sister came home this weekend so we could celebrate our dad's birthday. We decided to cook and celebrate at my house. My dad loves soup so I decided to start with soup instead of salad. I read through several corn chowder recipes just to get ideas, and then made up my own. It was the BEST soup I have ever made. Everyone loved it and my mom even commented that it was restaurant quality. I got some crab meat to stir into each bowl (instead of cooking it in the soup since we all don't like crab). 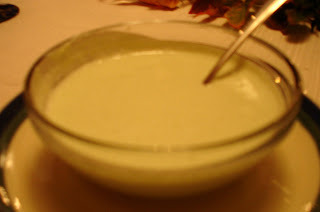 I also made a jalapeno cream that a few of us drizzled on top for some heat and extra flavor. I had a hard time getting a clear picture, but you can still see how colorful it was. Heat 1/2 stick butter in a soup pot. Add onions, green and red peppers, and celery. Saute about 7-8 minutes. Whisk in the butter-flour mixture and simmer for 15 minutes. When ready to serve, mix crab into each bowl if desired. Top with some jalapeno cream. I found this recipe on epicurious.com as part of a roasted pepper soup recipe. I thought the cream would go nicely with the corn chowder and it did! 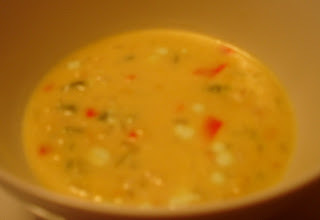 In a blender blend together the chilies, the garlic paste, and the créme fraîche until the mixture is combined well. The serrano cream may be made 1 day in advance, kept covered and chilled, and brought to room temperature before serving. I have some cream leftover and I may mix it into my cream cheese chicken sauce tonight. Jon cooked the filet the same way we did several weeks ago. 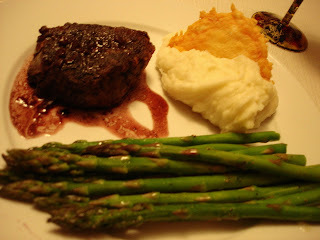 We used Sebastiani Cabernet Sauvignon for the wine sauce. Potatoes...I love potatoes. I never cook them because Jon doesn't like them! How can you not like potatoes? Anyway, tonight my sister and I made roasted garlic mashed potatoes. Roast garlic by chopping off the top, drizzling with olive oil, wrapping in tin foil, and cooking in a 400 degree oven for about 45 minutes. When done, mash each clove with a knife or spoon. Cook potatoes in water until tender; we made about 3 pounds. Drain and move to a large mixing bowl or keep in the pot. Start to mash the potatoes with your hand mixer; turn speed up and slowly add in 1/2 stick of butter, 1 cup of whole milk, 1-2 tbsp salt, and the roasted garlic. For creamier potatoes, use more milk or add in some heavy cream. I topped each serving of potatoes with a parmesan crisp. Mix 1 cup of parmesan cheese with 1 tsp flour. Spray a cookie sheet with nonstick spray, and then cover with parchment paper. Spoon some of the flour-cheese mixture on the paper, leaving about 2 inches between each spoonful. Press into a flat shape. Bake on 400 for about 8 minutes, or until golden brown. Let cool completely on the sheet. 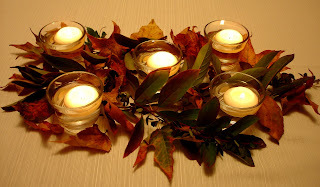 These can be made ahead of time and stored in an airtight container using wax paper to separate the layers. These little crisps looked nice on the plate and tasted great too. I'd make them for a salad as well. Asparagus - we tossed the asparagus in a baking pan with olive oil, salt, and ground black pepper. About 10 minutes in a 400 degree oven is perfect. About an hour after dinner we enjoyed a chocolate cake that my sister made from scratch. Good thing she likes to bake because I probably would have bought a dessert :) As I've said before, I'm not a baker!! I hate measuring everything so precisely and not being able to play with the recipes. My sister made a delicious cake that was the perfect ending to a great birthday dinner for our dad. And after dinner we all sat down to watch the Red Sox-Cleveland game. Unfortunately the Red Sox ended up losing, but watching baseball with our dad is something we always enjoy! yum! wish i could have been there for dinner! love the parmesan crisps atop the garlic mashed potatoes! Hi Steff!! I'm glad you liked it! I can't wait to make it again.